Back in 2009, Andy Field argued in a post on the Guardian Theatre Blog that “all theatre is devised and all theatre is text-based”. Cutting through arguments about “new writing” and “new work”, he reasoned that “to devise is simply to invent”, whether that inventing is done with words or bodies or any combination of the two. Job done, surely? Yet the disingenuous “text-based versus non-text-based” debate has rumbled on. It flared up yet again at the beginning of this year, when David Edgar was announced as Humanitas Visiting Professor in Drama at the University of Oxford and raised familiar concerns about the threatened position of playwriting and the playwright, met with retorts from the likes of Lyn Gardner and Andrew Haydon. While Edgar persisted in pitting other forms of contemporary theatre practice against playwriting, others agreed with Gardner that what we need now is “a far wider and looser definition around what we mean by new writing”. Alex Chisholm, writing in these pages over three years ago, argued much the same thing. But it’s not just about changing industry terminology. Current binaries are based in long-seated assumptions about the nature of the theatre text and the privileged place of the solo-authored play within British theatre tradition. Unsettling assumptions – and by extension the structures and processes that have congealed around those assumptions – is no easy task. It is happening, with the publication of books like Duska Radosavljevic’s excellent Theatre-Making: Interplay Between Text and Performance in the 21st Century and shifts in programming and commissioning at theatres such as the Bush and the Royal Court, but there’s still a way to go. Shifting understandings around text and performance means shifting the possibilities open to theatre-makers. Writing in the immediate aftermath of this year’s Edinburgh Fringe, where categories like “new writing” and “new work” seem more and more irrelevant each year, Matt Trueman suggested that “a new kind of fusion theatre is emerging”. He pointed to young companies like Barrel Organ and Breach Theatre, who seemingly don’t discriminate between new writing, devising and documentary theatre. He concluded that this slamming of one set of techniques into another creates a healthy and experimental theatrical landscape, in which “the possibilities are endless”. The picture sketched by Trueman is an exhilarating one, but there are still questions to be asked. Often, the supposed binary between “text-based” and “non-text-based” theatre has rested on larger ideological stakes; “non-text-based” work has frequently been seen as alternative, radical, progressive. But to what extent is that still true? Mightn’t real ideological interrogation, as Liz Tomlin suggests in Acts and Apparitions, lie in looking beyond superficialities of form? And in order to rethink the relationship between text and performance, we also need to think again about what it is the theatre text actually does. Is it a blueprint for performance? A set of tools? Is there really a difference between “open” and “closed” texts, and if not then is there anything that the theatre text makes impossible in performance? These are some of the ideas that I’m hoping we can address at Are We On The Same Page? Approaches to Text and Performance, a one-day symposium at Royal Holloway on 26th September. Bringing together academics, critics and practitioners, the aim is to erode old binaries and open up genuine, searching discussions, rather than re-igniting old antagonisms. 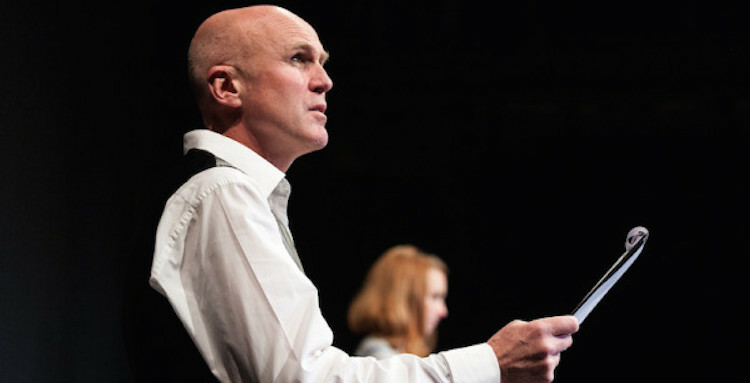 The day will open with a Q&A with Tim Crouch, whose work as a theatre-maker has repeatedly confounded distinctions between “new writing” and “new work” and challenged our collective understandings of theatre’s representational mechanisms. Field, Radosavljevic and Haydon are all among the panellists who will be speaking later in the day, alongside a range of other theatre-makers and academics whose practice and scholarship has in various ways engaged with some of the questions identified above. What we hope to generate throughout the day is dialogue in place of dichotomies. It’s about time we ended what Chris Goode calls “the phoney ‘writers versus devisors’ war” and started to interrogate some of the bigger, knottier issues that old battle has served to hide.